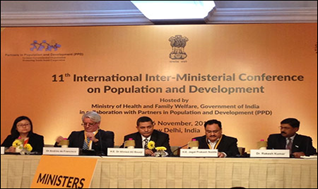 The Delhi Declaration acknowledges the strategic value of Partners in Population and Development, which currently includes 26 member countries currently representing nearly 60% of the world’s population, to the attainment of national, regional and global goals on health, population and sustainable development through South-South Cooperation. It emphasizes the importance of demographic dividend as a critical window of opportunity for improving equitable population, health and socioeconomic outcomes, with a focus on investments and appropriate alignment of national legislation, policies and resource allocation for adolescents and youth, as well as older people. recognize the importance of sexual and reproductive, maternal, child and adolescent health services, as well as the importance of engaging men and boys, as entry points to address violence against women and girls.